The United States has the capacity to take in more Syrian refugees, and it should play a leadership role in helping alleviate the global refugee crisis, Rep. Rick Larsen, WA-02, said today. Larsen’s call to action comes as Pope Francis addressed Congress and included a message about the need for people around the world to work together to ease the plight of refugees. “Pope Francis made a powerful case to Congress today about taking compassionate action to help the most vulnerable and marginalized people in our global community. He reminded the people of the United States that many of us descend from immigrants, and that we all seek similar things: hope, dignity and opportunities for our families. “The world is facing a massive crisis with the millions of refugees fleeing the war in Syria. International organizations estimate that more than 4 million Syrians have fled to other countries, and another 7.6 million have been displaced within Syria. Countries in Europe and the Middle East are grappling with how to support the huge influx of people asking for help. While the Obama Administration has announced that the U.S. will increase the number of refugees our country takes in from around the world each year, this move is not enough. “The U.S. has a long and successful history of offering a safe haven to those who are fleeing violence and severe hardship. We must not stumble on leadership now. We have the knowledge and resources to help refugees build a new life here. “The International Rescue Committee, one of the world’s leading refugee assistance organizations, has called on the U.S. to accept 100,000 refugees from Syria, a small fraction of the millions of people who have lost their homes. Leaders from many faiths, including Methodists, Lutherans, Unitarians and others, also have urged the administration to take in 100,000 refugees from Syria. The U.S. should accept this call. It is the right response to live up to our role as an international leader, and it is the right response to a rapidly worsening humanitarian crisis. “Some will say we should first help those who suffer within our own borders. I agree that too many families in the U.S. face hunger and uncertainty about where they might sleep tonight, and Congress should act to address this unacceptable reality. But as the largest economy in the world, we cannot ignore the plight of so many who have lost so much. “Pope Francis reminded us today of our responsibility to take care of one another. He reminded us that ‘if we want opportunities, let us provide opportunities.’ The words are simple, but they are forceful. Our country can and should offer opportunity to people who have lost their homes to violence,” Larsen said. 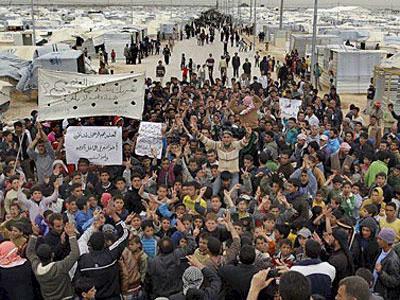 During the four years of the war in Syria, the U.S. has taken in a total of 1,500 Syrian refugees. Secretary of State John Kerry announced that the U.S. would accept 100,000 refugees annually from all over the world starting in 2017. This includes the 10,000 Syrian refugees that President Obama agreed to admit. The current annual cap for refugees from all over the world coming to the U.S. is 70,000.